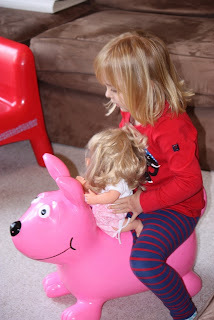 Lara has been having a LOT of fun bouncing around on her new Happy Hopperz dog who was sent to her to review by Hippychick. 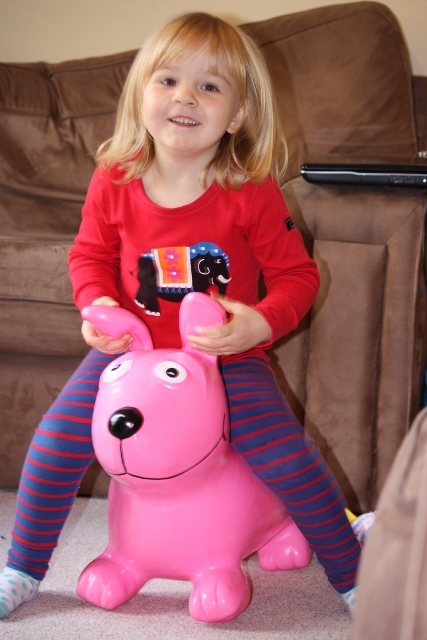 The Happy Hopperz is an inflatable bouncy toy, reminiscent of the hold space hopper but in really fun animal shapes and with four sturdy feet so they are suitable for toddlers from 12 months upto 3 years. Happy Hopperz come with their own easy to use manual pump. It didn't take too long to inflate and Lara was so eager to get bouncing that she barely gave me an opportunity to pump it up fully! The Happy Hopperz is suitable for use both indoors and out. We had to clear some space in our living room to get the most out of it. The box came with a few suggestions of fun games for your child to play on their hopper to encourage them to get bouncing and get exercise while having fun. Bouncing certainly makes good exercise - Lara is shattered after bouncing around the place for a while. I think part of the exhaustion is from laughing. There are squeals of laughter from both Lara and Holly. 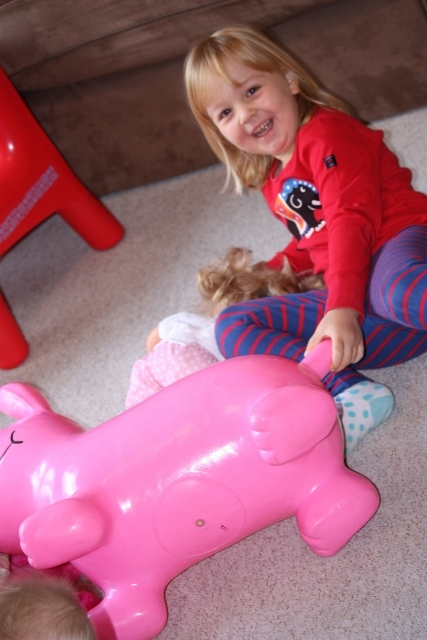 Holly loves watching her big sister do silly things and belly laughs when Lara is bouncing! I really like the little ears on the dog that Lara can hold on to and I'm really impressed with how stable it is - Lara very rarely falls off unless she is trying to make her little sister laugh REALLY loud. ASt less than £25 the Happy Hopperz is a really good value fun toy that could bring a lot of smiles on Christmas day and all through the year. Christmas Crafts, Recipes and Festive Fun!